Ann Arbor Spring Training Series: What's the Spring Training Series? What's the Spring Training Series? 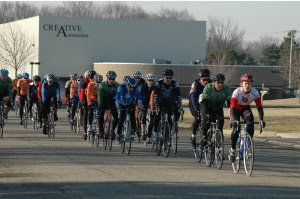 Entering its 26th season, the Ann Arbor Spring Training Series (STS) continues in much the same way it began: a fun, low-key, early season event for new racers to learn about bike racing and experienced racers to knock out the cobwebs. There’s a lot to learn with bike racing, much of which only comes from experience and practice. Traveling to big races, with experienced fields can be a high-stakes way to try out the sport. That’s why the STS includes some basic coaching and advice each morning before the racing starts and a setting to see if you’d like to do it again. Some people have been doing the STS for 25 years, others not quite that long, but many will do their first bike race at the Spring Training Series. Mark your calendar to join us for a windy and cold or sunny warm morning of racing—we get both every year.